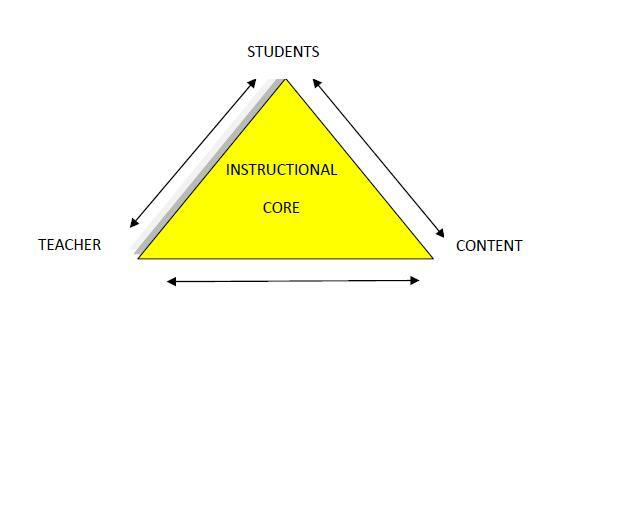 “the knowledge skill and material resources that are brought to bear on the interaction among students, teachers and content” (Elmore, 2008, p119). So this is where Archer’s theory of morphogenesis and morphostasis – how agents act upon structures and change them, resulting in both elements being changed, and this process being repeated over time – comes in. In the context of learning rounds this now looks very interesting. Teachers observe and change their practice, adjustments are made to students tasks which require a different type of engagement from them. The three elements in the model have changed, and the whole scenario has shifted, become something different. The questions around what makes the changes happen come into focus – can I identify the structural and cultural conditions in this that are working to facilitate the changes? And how does agency manifest itself in the process? 4. The design of work in schools is incompatible with improvement. Teachers work in isolation and opportunities to engage in “continuous and sustained learning about their practice in the setting where they actually work” (Elmore, 2008; p127) are difficult to build into the structures of schooling. 5. Lack of guidance on performance and accountability. Internal accountability needs to reflect external accountability. Schools weak in internal accountability see a causal link to outside factors beyond their control and develop a sense of passive helplessness. Schools with strong internal accountability know their success is due to themselves and their own practices, shared values, knowledge and skills. This entry was posted in CPD, Learning Rounds, PhD, Teacher Education and tagged Elmore, instructional core. Bookmark the permalink. Fascinating, Catriona. I read all this through the prism of our Working Together project, of course. Long ago as that project was, it seems to have hit a number of the buttons you mention here. The challenging ideas came via observations from the LS teachers who knew the pupils from a different perspective, but who also knew the teachers and the school context, so provided a way of breaking down internal barriers to improvement. The main motivation for change, of course, came from ML teachers themselves who knew they were not coping as well as they wanted to, but didn’t know where to start putting things right. We didn’t tell them what to do, we just created the conditions in which they could see what change was needed and began to understand that they were capable of achieving it without ‘outside’ interference. – Or perhaps it is just that my spectacles have acquired a rosy hue in the intervening years! That’s a brilliant way to look at Working Together Hilary! Well done – I hadn’t made the connection myself. Viewed this way, I wonder if the practices we were developing there might have had a bit of further reach? I think it shows that lending a bit of theory to something gives it an anchorage and maybe a bit of stability in the ebb and flow of what’s “fashionable” or maybe that me with my rosy glasses on! There will be more on this! Thanks, as ever for your interest and patience with me! Well, we know change happened and we know that at least some pupils’ attainment improved as a result, so we must have been doing SOMEthing right! Perhaps you’re right: we were using intuition rather than proven theory.